Ms. Aruna is a certified U.S. Math Faculty of Dept. of Education, US Govt. Her educational qualifications include M.Sc. (Mathematics), M.Sc. (Statistics), M,Sc (Computer Science) and B.Ed. She has a Green Belt Certification in Career Counseling with Distinction from the University of California-Los Angeles (UCLA). She has served in reputed institutions in both India and USA. Ms. Aruna also has immense experience in administering U.S. High School Qualification Programmes, viz., Advanced Placement Programmes (AP), including AP Calculus & AP Statistics, and is an expert in IB-DP Mathematics Higher Level and CAMBRIDGE A/AS Level Mathematics. 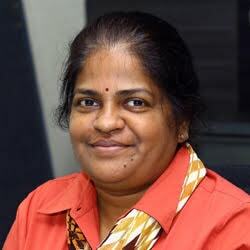 Ms. Aruna Kalyanaraman brings with her a rich experience in Pre-University Programs including IB-DP, Cambridge CIE and U.S High School Qualifications with AP of College Board. She is certified as a Mathematics teacher by the Education Departments in New Jersey and New York. She is an experienced academician and has to her credit more than 23 years of service of which more than a decade was served in diverse roles in the capacity of Coordinator, Examiner and Moderator, across various International Boards, in India and USA. Prior to joining Candor, she has worked in CPS Global School, Chennai, as the Head of School. She was earlier imparting education in The Canadian International School, Bangalore, Concord High School – New York, Abraham Clark High School – New Jersey , J H Ambani School – Surat, and Naval Public School – Visakhapatnam. She was instrumental in devising the best practices in Pre-University curriculum that aided students to gain an average of grades 5 +. She successfully guided many of her students to secure admission in reputed educational institutions including MIT, Cornell, Duke, Purdue, Columbia, Boston College and Lafayette in the US, as well as other top institutions in the UK, Europe and Asia. The qualification, experience and wide-ranging exposure of Ms. Aruna, combined with her global understanding of the fresh challenges that students face, vis-à-vis their curriculum, study formats, skills sets, will provide the right impetus to both the faculty and students. The parental concerns, for the upbringing of the child, properly equipping them to face the rigours of the ever-changing and demanding global world, are also fully addressed. She belongs to the new age teaching fraternity and fully understands the requirements of global citizenship including 21st century skills, imparting international mindedness with socio-politic-economic-environmental understanding, future technologies and risk management. She is a member of reputed Societies for Mathematics for teachers. She has worked closely in the area of Career Counseling and University Placement. She strongly believes in Creative, Child Centric and Holistic education and has a proven track record of producing excellent examination results. Her inclusion into Candor strengthens its team of academic leadership.